If you happen to visit Thailand this November, there's a fantastic festival you definitely can't miss -Loy Krathong. Known as Thai Festival of Lights, Loy Krathong is one of Thailand's most enchanting and the second best-known festival after its New Year's festival Songkran. The Festival is held annually all over the country, as well as parts of Laos and Myanmar (Shan State) where it is called Tazaungdaing. 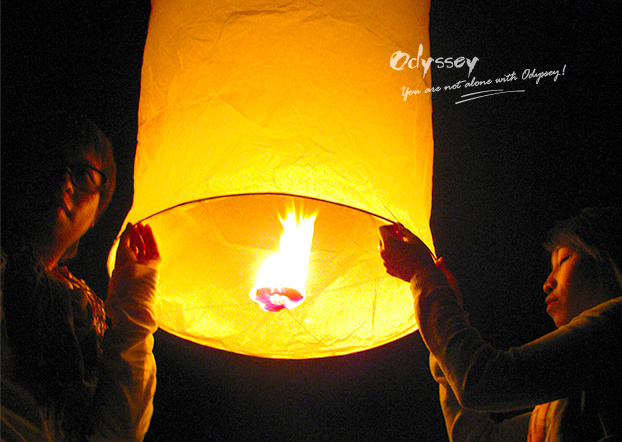 Read on and find inspirations for how you can experience Loy Krathong as fully as possible. Krathong is a Thai term which refers to a piece of banana trunk decorated with flowers, banana leaves, candle and incense sticks. The word Loy means to float in the Thai language. When put together, those two terms simply mean floating banana trunk festival. Modern krathongs are mostly made out of bread or Styrofoam. But Styrofoam krathongs are sometimes not allowed as they pollute the water and they are difficult to decompose. Bread Krathongs are more environmentally friendly as they are biodegradable and in most cases eaten by fish. Why do Thai people want to float a krathong? There are many stories regarding how the festival originated. One of the versions is that Thai people have long been closely involved with rivers for ages as Thailand is an agriculture based country. This means rivers are like their own blood veins. And to show respect to the river, basically the goddess of the river called Pra Mae Khongkha, Thai people decided to make a Krathong to worship and ask for forgiveness. The Thais now also see it as a time to wave goodbye to misfortune, wash away sins of the past year, and make wishes for the coming year. When is Loy Krathong celebrated? Loi Krathong takes place on the evening of the full moon of the 12th month in the traditional Thai lunar calendar. In the western calendar, this usually falls in November. The exact date is announced a month before the festival. Hence the following dates are not confirmed dates. They are the full moon days on which the festival is based. Where to celebrate Loy Krathong? Loy Krathong is celebrated all over Thailand. You can go and enjoy the festival almost everywhere in the country where it has water. However, there are certain places which hold the festival in a much bigger scale. And our recommendations are Sukhothai, Chiang Mai, and Bankok. 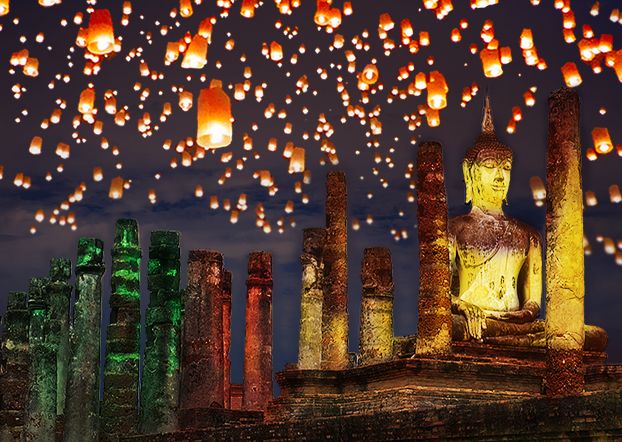 Located in the central of Thailand, Sukhothai is believed to be the birthplace of Loy Krathong, and is still one of the best places to experience the joyous festival. Loy Krathong in Sukhothai is celebrated for five days. In addition to magical floating lights, there are beauty contest, parades, folk music performances and light and sound shows. 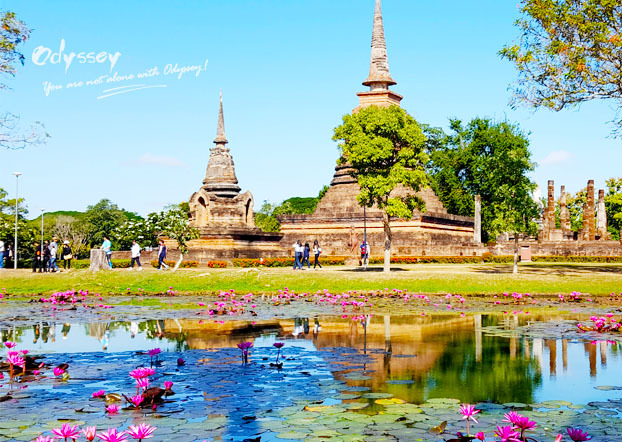 Nearly all the festivities take place in Sukhothai Historical Park (the old city). If you want to see Loy Krathong in Sukhothai, remember to book hotels well ahead of time as it is a popular tourist destination with a limited number of hotels. Chiang Mai is where Loy Krathong meets Yi Peng, a lantern festival celebrated alongside Loy Krathong. As the largest city in northern Thailand, Chai Mai is known for its flying lanterns rather than its floating offerings. People who visit Chiang Mai during the few days of the festival can also enjoy some of the city's most incredible parades, firework display and traditional art performances in public places. 1. Book your accommodation in Chiang Mai with as early as possible. Prices soar as the festival draws near. 2. Arrive at the Lanna Duthanka Buddhist Center in Mae Jo University early to get a good spot. Although the praying ceremony and lantern release will only take place in the evening, the place gets incredibly crowded. 4 pm onwards would be a good time. 3. If you indeed arrive early, there will be a lot of waiting time under the sun. Bring some sun block, food and drinks. You wouldn't want to move from the spot you came so early to guarantee. 4. If you're going to Wat Phan Tao or other temples before the lantern release, do not bring your lantern with you! They are not allowed inside the temples. 5. Bear in mind that this is a religious event. Keep quiet during the prayers prior to the lantern release (around 1 hour). 6. Make sure to cover shoulders, knees and chests if you want to explore the temples. Don't wear tank tops, shorts, or anything revealing. 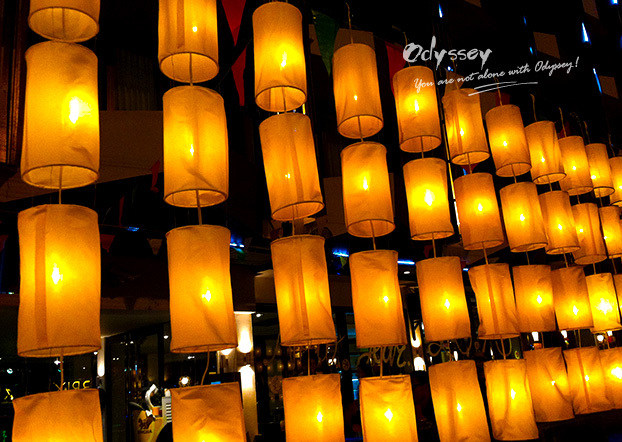 Apart from Sukhothai and Chiang Mai, Bankok is also a great Loy Krathong destination. The city boasts many ponds and waterways in public parks where families, friends and lovers gather and set off their krathongs. Watching the route that a krathong takes is a popular way for couples to predict what the future holds for their relationship. Wat Arun and Wat Yannawa are also good options for launching krathongs down the Chao Phraya River. Advice: Buy krathongs made of natural materials, including banana leaves, banana tree bark, spider lily plants and bread, instead of Styrofoam, glossy paper and brightly hued petals. 1. The four components of a krathong are symbols of Buddhism. The candle is a symbol of knowledge and wisdom. The joss stick is a symbol of purity and sympathy. The flower represents worship of monks who are disciples of Buddha. The worshipping item is used to make merit for deceased ancestors. 2. Strands of hair, nail clippings or even bits of clothes that one doesn't use anymore are often put into a krathong to get rid of the bad stuff of the past. 3. Coins are added to krathong to bring wealth and as a way of making merit. 5. According to a survey done by a certain condom company, Loy Krathong is the festival, second to Valentine's Day, when teenagers lose their virginity. Q: How to enjoy Loy Krathong Festival in Bankok? Most public parks in Bangkok are close in late night. However, during Loy Krathong , many parks are open for the festival. So this is a good chance to enjoy the park at night and there are no entrance fees for each park and for floating your krathong as well. This is possibly the most exclusive and luxurious way to enjoy Loy Krathong Festival. There are many riverside hotels in Bangkok, ranging from five-star hotels with spectacular river views to the affordable ones that might not be located next to the river bank but close enough to see the view. A river cruise tour is one of the best ways to really get into the heart of the festival by literally floating in the river! There are plenty of river cruises in Bangkok. Most of them will offer you a buffet on board, drinks (sometimes exclude), Thai traditional performances and live music performance. This can be the cheapest and most entertaining way to enjoy Loy Krathong. Because it's most likely that you don’t have to pay any fees like an entrance or activities fees. Without those barriers, you will feel the spirit of the festival more as well as the crowd! Q: What's the difference between Loy Krathong and Yi Peng? A: Loy Krathong and Yi Peng are two similar but actually different festivals. First, their most important difference is perhaps where they're celebrated. Yi Peng is only celebrated in the north of Thailand, and its most elaborate celebrations take place in Chiang Mai. Loy Krathong, however, is observed all over the country. The second difference is the lanterns that are used and how they’re floated. For Loy Krathong, floats made out of banana trees, bread or Styrofoam are set off in water. But for Yi Peng, lanterns are made of bamboo, and fuel cells. They are launched to the sky rather than the water. Q: How can I get a krathong? A: It’s easy. You can buy one. You can find them at the street vendors, or if you are a guest of a hotel, it surely can offer you one. Another way to get a krathong is make one yourself. During the festival, most hotels in Thailand offer their guests chances to make krathong themselves. Q: How do I float a krathong? A: After you have your own Krathong, head to the water source – most likely rivers, ponds, lakes or even pools! Then light up the candle and incenses, make a wish and let it go! Q: Do I need tickets for the Yi Peng festival? A: The festival takes places in various parts of Chiang Mai and is free for all. Traditionally, there are two major lantern releases each year: a paid event in English and the free public event for locals. The paid event is not run by the government like the rest of the festival and is usually held before or after the actual festival. Tickets cost $100 per person, and it takes place outside the city center. The benefit is that there are no crowds and there are explanations of the event in English. Found this post helpful? Why not share it with your friends? Any questions regarding Loy Krathong or Thailand travel, feel free to let us know at .